TwistED Science is the home of the hands-on science specialists! Visit us at our HQ in Echuca or invite the team on wheels to your event. Rolling out from our Melbourne warehouse, you may see us on a road near you. Come and visit our award winning, hands-on family play space, with a difference in Echuca, Victoria. The twistED on Wheels team travels to you in Melbourne and regional Victoria from our warehouse base in North Melbourne. The team at TwistED Science are science communication experts and we pride ourselves on bringing maximum fun to every event! Whether you need something different for a holiday program or fete, are looking for a exciting kids' birthday party or need some curriculum based workshops for your school, we've got you covered. You can even come and visit us in Echuca, Victoria at our award winning, state of the art Playzone. It is jam packed with interactive play stations and unlike some other science museums we love mess and encourage full hands-on participation. We're all about having fun, being active and sharing the experience! Have a party in our HQ or at your place! 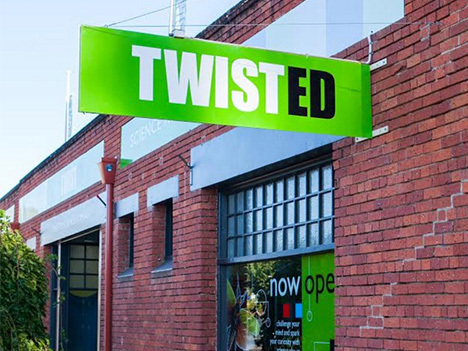 Twisted HQ in Echuca or Travelling parties in Melbourne and surrounds. New creative play area for Tots! The twistED head office and science centre is situated in the historic Port precinct of Echuca. Housed here is a permanent home to our action stations, The Pod, our group space, and a funky science retail area. Looking for more activities to do when visiting Echuca-Moama? Check out the brand new, and very exciting Echuca-Moama Supapass below! It includes deals and specials from heaps of family related businesses in the area! twistED on Wheels can bring the science fun to you! The twistED on Wheels team trucks out of our warehouse in North Melbourne and brings a mobile version of all our sessions to you in and around Melbourne and just about anywhere else in southern Australia. Check out our action stations at twistED HQ- more science, more play, more fun!